In honor of Earth Month (April), Birch & Lace will be hosting their 4th annual Trashion Show Contest. This year we are moving the event downtown to the Revelstoke Legion! We are encouraging participants to enter our contest by designing & creating an outfit out of recycling & garbage. We will then showcase these outfits with a Fashion / Trashion Show. There will be prizes for winners of the contest and a stellar silent auction for event goers – all of the money raised will be donated to the North Columbia Environmental Society and a global clean water advocacy group. Donate: This is a good opportunity to support community & show you care about waste diversion and our planet, help us put together an amazing silent auction and prize packs for contestants. Donations with a value of $50 or more are eligible for charitable tax receipts. Volunteer: help us with set up, arrange designers and models, engage with local businesses and residents to promote the event! Attend: Come support the creative minds of Revelstoke residents – we will announce when tickets are available for purchase. 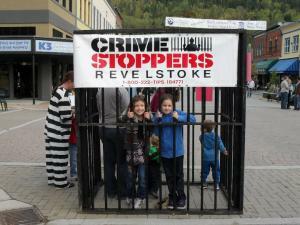 Revelstoke Crimestoppers is hosting a Spring Home and Garden Showcase. Vendors will be featuring new and existing merchandise to help you do your spring cleaning. Whether you want to spruce up your yard, your home, or your wardrobe, you’ll find something to interest your whole family. Plus, you could take advantage of the Crimestoppers’ jail cell and have your friends, enemies or maybe your boss thrown in jail until they can raise the bail money.